This is just a simple fajita recipe I came up with when I was working on summer recipes a couple weeks ago. I am by no means an expert on Mexican cuisine, but this is my easy interpretation of beef and onion fajitas. I served it with a nice and fresh orange salsa which really made the dish great for those warmer summer days. Make the orange salsa. Mix the oranges, red onion and lime juice and reserve. Add the cumin and chili powder to a bowl and mix. Rub the beef strips with the mixture and reserve. Cut the onion and peppers into thin strips. In a sauté pan on medium heat add a good drizzle of olive oil. When the oil is hot, add the onions and sauté for 3 minutes. Add the peppers and cook for about 10 minutes or until the pepper have softened. Season with salt and pepper. Add the beef strips and cook for 4-5 minutes or until the meat is just cooked through. Taste and adjust seasoning with salt and pepper. Warm up the tortillas in a cast iron pan on medium heat (2-3 minutes). Add the beef mixture, a small handful of coriander leaves and roll the tortillas. Serve warm and garnish with a spoonful of the orange salsa. I'm OBSESSED with salsa, and am all over that orange variety - thanks for the recipe!! Well it certainly looks delicious! I love the photo where the orange in the fajitas is repeating in the background with the orange peppers! I don't know why, but I prefer the taste of orange & yellow peppers. This looks so good, so easy to make, yet so flavorful. Stellar photo! My husband loves salsa...I think he would fall head over heels for this meal! This would be lovely in the summer...or next Saturday, when we're going to flirt with 75 degrees for one day, possibly! The salsa sounds especially refreshing. Mmm, orange salsa sounds so delicious. I'm a huge fajita fan. The smell of the sizzling onions and beef--it's just divine. I can't wait to try your take on the dish! 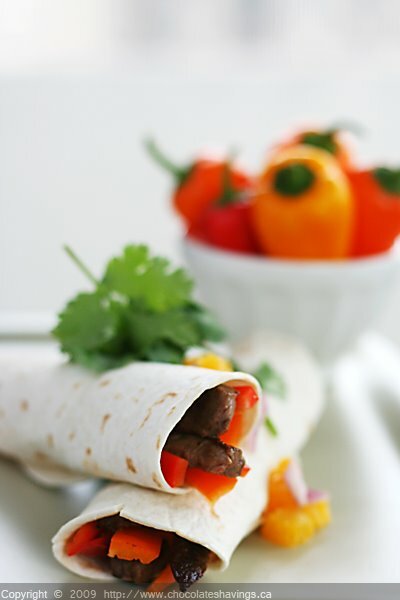 Gorgeous fajitas and the orange salsa sounds excellent! I love orange with beef! Great recipe, the color is soooo vibrant! Wow - I love the orange salsa. I always make mine with mango, which I have to usually make a special trip to the store to get. I always have oranges around. I'm going to remember to make this! Yum, and FINALLY the orange, yellow, and red peppers are on sale. Also, yes we are having a great time with the nice weather, we are so excited for the Atwater market to go into full bloom.We usually spend our Saturday mornings there. Do you shop at the markets? Well we live pretty close to the Atwater market, I have a great apartment on Monkland, a block from the Villa Maria metro... then it is just three stops from the market. I love Jean Talon but it's so much harder to get to from NDG. Seeing all your summer cuisine makes me yern for the beautiful fresh fruits and veggies! Looks delish! And orange salsa sounds sooooo refreshing! It has bee way too long since I last had fajitas! I like the sound of that orange salsa!